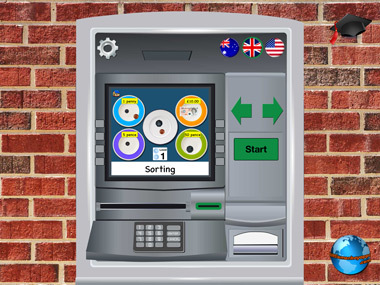 Little Monkey Apps Teaching Money provides another format to help your students become more familiar with money, recognising coins and notes, paying for objects, coins and notes of equal value and giving change. The App is broken into a teaching module and five task based modules; Sorting coins and notes, Piggy Bank, Toy Store, Giving Change and Show Me. At this stage, Little Monkey Apps Teaching money is in Australian Dollars, UK Sterling and US Dollars. 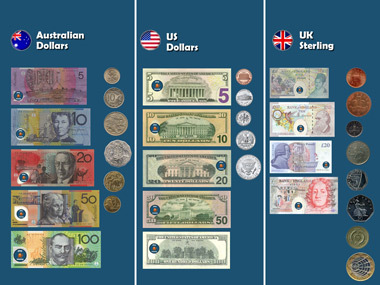 All coins and notes have been altered in line with country laws. (We've put our logo on!) 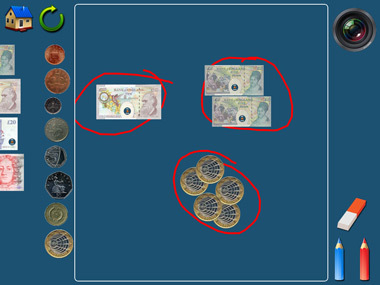 Use the flag to select the currency. Apologies if we keep saying dollars, but you know what we mean! Use the settings tool to have coins start on tails or a mix of heads and tails. 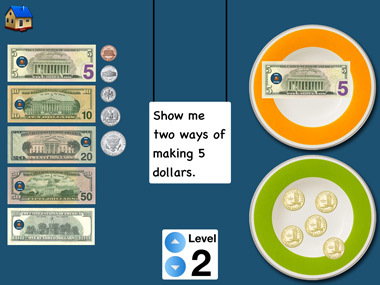 Little Monkey Apps Teaching Money is aimed at providing digital scenarios or task based money questions. It does not replace the importance of play based and open ended real life experiences. The App enhances your classroom pedagogy, by providing a different way of presenting the same curriculum standard. Whilst some of the sections or 'modules' can be completed without teacher direction and encourage student-directed learning, our Apps are NEVER designed to be used as a 'learn by yourself' without teacher-student interaction. A blank screen with coins at the side. Use this tool to discuss money, look at the notes, give verbal scenarios to children etc. Use the pencil tool just as you would use a whiteboard, then the camera tool to record what the student has achieved. You might like to use it in their learning portfolio, revisit the problem in a subsequent lesson, display on your large screen to discuss with a small or whole group etc. Don't forget to use real coins with your students (plastic or laminated ones too) for that shop corner you are going to set up or for all those fantastic money games that you have. Personal favourites are money stamps and an ink pad, coin rubbing, bingo, card match, 'learn to earn' days and board games which use money. 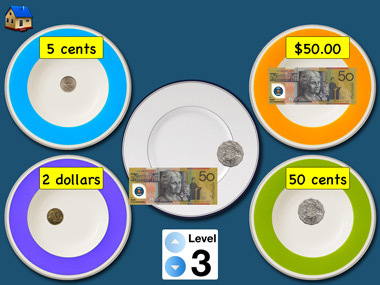 This task asks the student to sort the coins and notes from the middle plate to the correctly labelled plate. If they get a coin or note incorrect, the plate, the coin or note wobbles once the coins and notes have ALL been placed. This way, they have a chance to self correct before being told they are wrong immediately. Three levels, coins, notes and coins and notes. Double click the coin to turn the coin or note to its alternate side. Without the iPad, put a divided dish and a bucket of notes or coins. Ask the students to sort the coins. Alternatively you could use cash registers and have the students sort the money in the right place, explaining that it makes it quicker and easier for the salesperson. Put the coins and notes in the piggy bank to see the money added up. Double click the pig or shake the iPad to tip the money back out. Use as a helper to addition problems or worded pocket money. Or let the children play to see how much money they can possibly put in! We're not too sure how many students would have a piggy bank these days, but in the classroom you may or may not do fund raising or something similar. Use this opportunity to count REAL money. 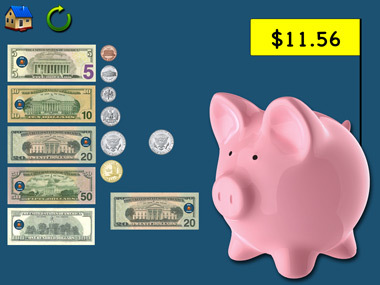 Another idea is to fill a piggy bank with small denomination coins and the other with a few high denomination coins, ask students which pig has a higher value. Great discussions can ensue! 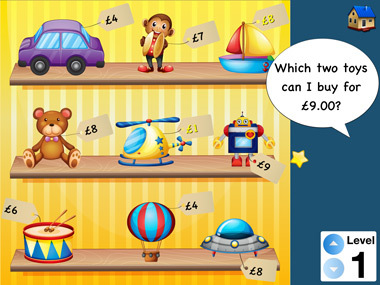 This task asks students to buy more than one toy for the amount given. Level 1 up to ten dollars through to level nine up to $250. its highly unlikely that young students would be able to do level nine, but we had one child who was ACE at adding money so we put this in for him! Off the iPad, we suggest setting up a toy fruit store or bakery, toy cash register, toy money and allowing the children to PLAY, PLAY, PLAY in this area. You also might like to visit a local market and have each group of children buy a set of items (or one item each), returning to school to make fruit salad (or something else you are allowed to do).You might even get onto the discussion of price differences and price per weight amount. 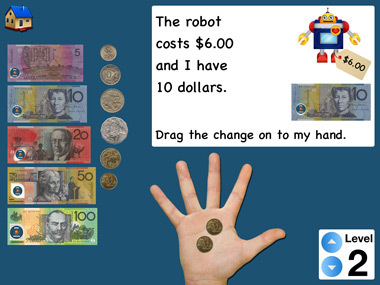 The student is asked to put coins into the hand for the change they will get from the given amount. Level 1 up to ten dollars, up to level 5 for $20 with a note and coin change. This module asks you to show two different ways of making a value e.g. five dollars, placing the two separate ways on the two plates. Levels one asks for up to one dollar to level five up to twenty dollars. It is great teaching point to watch and ask students why they chose a particular way of making up the amount. Similarly, you could have students work in pairs to encourage the verbal discussion of how to go about the task. Off the iPad, don't forget your shop corner! Simply remove all of a type of coin e.g. 10c and $1 and see how change is given. This can cause a bit of disruption, confusion and angst so you might want to do this as a small teaching group first! More currencies will be provided at a later date, depending on demand. Please get in touch if you are a school and have a specific need for a particular currency.